Last night, I arrived home to a box of my books…not drafts, not proofs, but the real-deal printed books! One of my very favorite older adults did the cover art…I can’t wait to show her how it turned out! 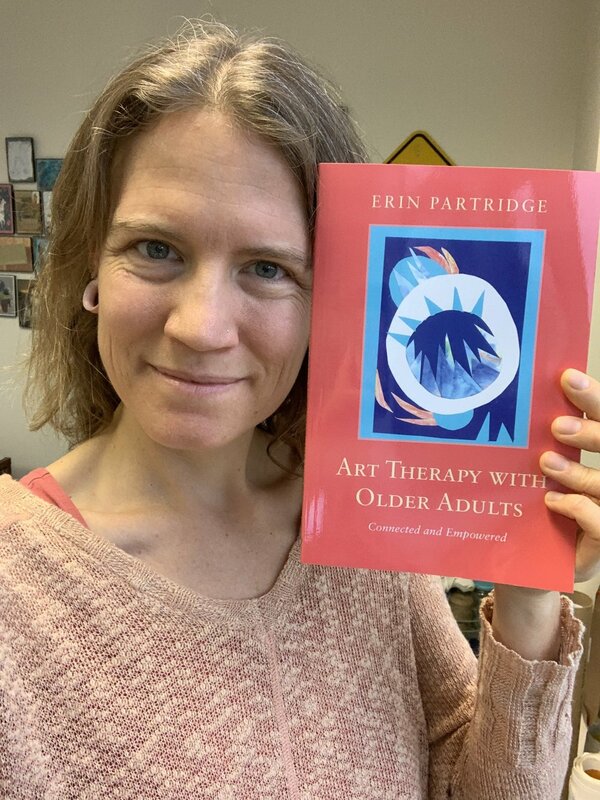 Though this is an academic, clinical book, it is filled with stories from the work I do; I believe many will find it enjoyable to read and full of respect and reverence for the amazing older adults I have joined in the studio. It should be available for ordering anywhere books are sold. Using masking fluid allows us to build up layers, preserving bright colors & textures...this piece is currently on round three of masking fluid & pigment. It can feel like it is wasting time to take an hour or so to just play in the studio...but even time spent splashing paint on paper with no real plan can be so restorative. It was a busy week and I needed to just play with color. This paper will be turned into my next art journal eventually, but this weekend it just needed to be about fun and experimentation. What have you done with a playful spirit today? Recently, someone noticed a stamp sitting on a shelf in the studio. Old, worn, leftover from an office or business practice long gone. What does this word mean to you? How might you use it in your art? All ready for today’s participants in Intention & Expression! We will be working with themes of change in both the process & subject matter of our art.